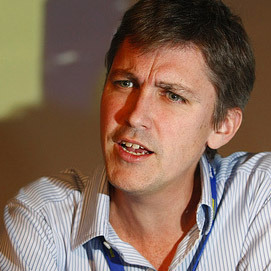 Steven Johnson is the best-selling author of five books on the intersection of science, technology and personal experience. His writings have influenced everything from the way political campaigns use the Internet, to cutting-edge ideas in urban planning, to the battle against 21st-century terrorism. His most recent book, The Ghost Map , was one of the ten best nonfiction books of 2006 according to Entertainment Weekly. Drawn from one of the defining moments in the invention of modern life, The Ghost Map is a gripping case study in how change happens, the turbulent way in which wrong or ineffectual ideas are overthrown by better ones. Steven has also co-created three influential websites: the pioneering online magazine FEED, the Webby-Award-winning community site, Plastic.com, and most recently the hyperlocal media site outside.in. Both social critic and technologist, Steven has a genius for mapping the future—for predicting and explaining the real-world impact of cutting-edge developments in science, technology and media. Steven is a contributing editor to Wired magazine and a Distinguished Writer in Residence at the New York University Department of Journalism. He lectures widely on technological, scientific, and cultural issues. Named by Newsweek as one of the “Fifty People Who Matter Most on the Internet,” Steven has also written for The New York Times, The Wall Street Journal, The Nation, and many other periodicals. He’s appeared on many high-profile television programs, including The Charlie Rose Show, The Daily Show with Jon Stewart, and The NewsHour with Jim Lehrer. He blogs at stevenberlinjohnson.com. Steven is an articulate and thought-provoking, funny, animated and engaging speaker. Drawing on the story of disease and urban terror from his 2006 bestseller, The Ghost Map , Johnson will launch dConstruct with a keynote address on the information networks that form on the sidewalks and public spaces of urban life. He’ll examine the many ways that those social systems are migrating to the emerging platform of the geoweb. The rise of location-aware devices and increasingly mainstream geotagging presents an unique opportunity to unite the real and virtual worlds, and bring new life to the troubled newspaper industry. But that opportunity is going to require innovative new tools for navigating the geoweb, which the keynote will explore in some detail — including a first look at some new projects under development at outside.in.